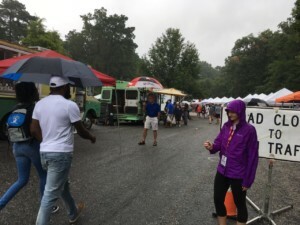 VAFMA is rallying all farmers market managers in Virginia to collect data on the impact their markets are having on their communities. Data is incredibly useful for demonstrating how important farmers markets are to our localities and state. It is also beneficial for improving decision-making, market promotion, media relations, advocacy and fundraising. When market managers take control of their data they are better able to run their markets without having to rely on other organizations to collect that data for them. 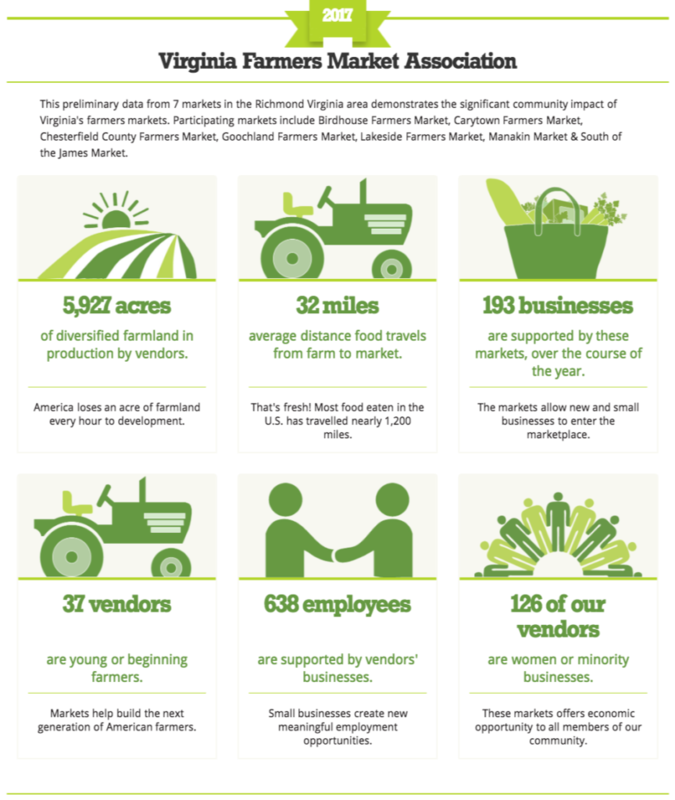 VAFMA has teamed up with the Farmers Market Coalition to offer a metrics program that empowers market managers to collect, analyze and share data. This self-paced course includes training videos, user guides, templates and optional call in data clinics for Q&A. Participants also receive FREE access to FMC’s Farmers Market Metrics data portal ($252/year value). Farmers Market Metrics offers tools and downloadable templates for data collection and management, automated report design, and resources to assist with promotion. It is an excellent opportunity for market managers to learn how to collect data and how to leverage that information to grow their markets. 2019 participants will also receive VAFMA’s Social Media Content Calendar for market managers. This useful planner highlights special dates, marketing ideas & monthly tips to help market managers plan farmers market promotions. Who is eligible to join our program? This offer is only available to farmers market managers of physical farmers markets in Virginia. Thanks to a Farmers Market Promotion Program grant, the program is FREE for participants who register in 2017-2019. Participants do agree to collect basic data detailed below. What if I’m not ready for the full metrics program? I’m registered. Now what do I do? Visit the First Steps Page to get started. 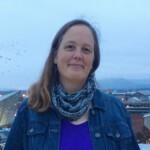 Since 2009 Mary Delicate has devoted her marketing, research and web design skills to promoting local food in Virginia. She has created websites, newsletters, blog posts and social media posts spreading the word about local farms and farmers markets. 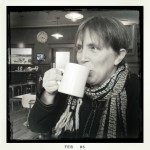 Prior to discovering her passion for local food, Mary was a business information researcher. She spent her days searching periodicals, studies, reports, databases and websites pulling out relevant data and insights for entrepreneurs. 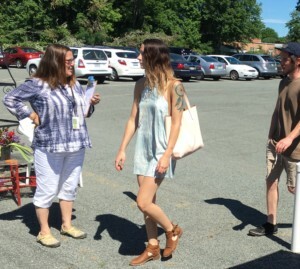 Mary loves visiting farmers markets so don’t be surprised to see her at your market! Word of warning: don’t get her started on local food, nutrition, and social media unless you have some time to talk. Marian comes to FMC with over a decade of market research, business development and data intelligence experience from the financial services industry. The decision to make a mid-career shift has allowed her to work for an initiative very close to her heart, as her family comes from generations of dairy farmers in SW Ireland. 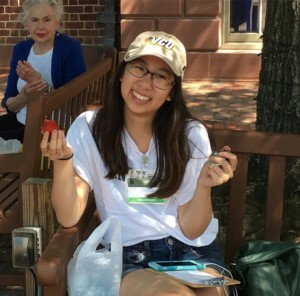 Marian has seen firsthand how thoughtfully developed farmers markets have the capacity to transform neighborhoods, stabilize local farmers, and foster a holistic and meaningful ecosystem in ways that traditional food systems cannot. She has been committed to the local food movement for several years, and acquired lasting friendships, hobbies and sense of purpose in doing so. In her spare time, Marian is a native plant gardening enthusiast, a serial animal fosterer, and a compulsive homemade-pasta maker. With fresh, local ricotta. Obvi. Marian can be reached at (888) FMC-8177 ext 709, or marian@farmersmarketcoalition.org. Darlene Wolnik is a national advocate and trainer for farmers markets and has worked in the field for over fifteen years. Her background contains both extensive community organizing initiatives and innovative small business projects. She managed markets for for New Orleans-based Market Umbrella while serving as its Deputy Director. She also designed and ran the organization’s marketshare project, one of the first technical assistance and resource sites for markets in the US. 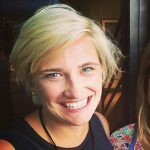 In that role, she created over 70 free resources and tools for markets. Since June of 2011, Darlene has consulted for dozens of market projects ranging from design and strategy, resource development to data collection and analysis. She authored the 2013 Vermont Market Currency Feasibility Report and the 2014 Local Food Awareness Report for Gulfport MS, both found on her www.helpingpublicmarketsgrow.com website. Darlene can be reached at (888) 362-8177 ext 708, or darlene@farmersmarketcoalition.org.